If you are a Pixies fan, but never gave much of a chance to the solo material from the band's frontman Frank Black, you might want to check out a new compilation called Frank Black 93-03. The compilation will be released June 12. It is a two-disc set that also features a disc of live recordings. 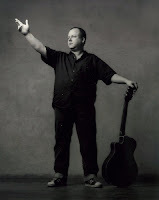 In addition, the collection will feature one brand new song from the forthcoming Black Francis (the name Black used during his time in Pixies) album. The European, Japanese, and US versions will all feature slightly different track listing on the live disc. Sounds like a winner to me. I have always liked Black's solo stuff. It's a diverse mix of styles and themes. It's not the Pixies, and once you get past that, it is a lot easier to enjoy.